Is it a short post-truth slide presentation? A Hoodwink commission in a Wilkinson's store in Folkestone. ''The ‘classic’ American road movie was both an emblem of achieving and escaping from the American Dream.The car, the road and the hero are the holy trinity of American cinema. But what would a convincing UK road movie look like? What architecture would it traverse today? How would the plot develop if it were constructed from the shapes and patterns of the ubiquitous data collected from ANPR technology? What would its journey tell us if the data were combined with how researchers approach and analyse the data? 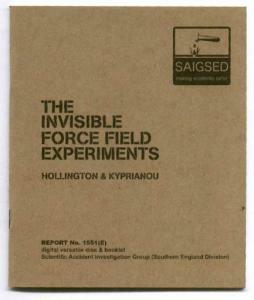 From the archives: Documentation from the sealed room installation in the Invisible Force Field Experiments. A residency and exhibition at Allenheads Contemporary Arts, Northumberland. Footage of Heathrow airport at a standstill, closed due to a no fly zone imposed by a volcanic ash cloud overlays Marinetti’s 11 points from the Futurist Manifesto read out by computer. To See You Is To Love You is a re-edit of Alfred Hitchcock's Rear Window with all the windows taken out. The entire film focusses on the gaze and gestures of Jimmy Stewart. Stewart never leaves the apartment, the audience never leaves Stewart. Airplane, a melodrama is a re-edit of Airplane! with all the jokes taken out, returning it to its pre-spoof roots as a melodrama. Returning to documentation from Values for A New Age, this dual screen installation shows a wineglass appearing to move by itself across two cctv monitors. The film's title is taken from the German national anthem. It records the beginning moment of transition of city life at the end of a world cup match. "These highly sought after objects were once lovingly mass-produced. They are presented here in pristine condition for inspection in the pre-auction viewing for an event which promises to be the most exclusive sale of 2034." In collaboration with Spinwatch and Platform. The Domestic Military Complex (Semiotics of the kitchens) documents a domestic vacuum cleaning robot patrolling a kitchen disguised by a cardboard box with a rudimentary drawing of a tank on it. Figuring Landdscapes, touring video programme: TATE Modern, Showroom, Sheffield, Chapter Arts, Cardiff, Cinemateque, Brighton, Bureau, Salford, Dundee Contemporary Arts, Vivid, Birmingham, Hull Film, FACT, Liverpool, Dell Gallery, Brisbane, Gallery of Modern Art, Brisbane. 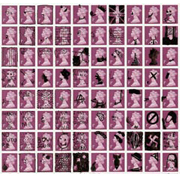 An edition of 100 one penny stamps. Part consultation exercise, part industry PR campaign, visitors can nip round the back and look around the back-end operation, revealing a just-deserted nightwatchman's hut and a nuclear facility in the middle of a meltdown. Far from empirical science and technological progress dampening the enthusiasm for magical or spiritual readings, the use and improvement of technology trades on the same sense of awe and the uncanny previously provided by mystical phenomena. The symbiotic relationship between technology and the uncanny is not only one of a shared notion of the sublime, but also one of appropriation. In a former video rental shop's 'avaiable now' display, a video monitor relays cctv footage of painted video signal test bars. 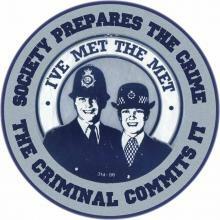 A newspaper that records the Battle of Oxford Street, modified security signs and a situationist-revised "I've Met the Met" sticker. Ccctv cameras are trained on objects surrounding an information desk. A channel switcher cuts between close ups of a brifcase, a phone and a clock creating a live cinema set. 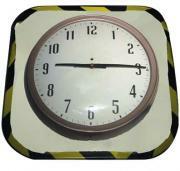 The clock ticks loudly providing a metronomic tension, its seconds hand moving backwards and forwards. The sound is rerouted into the suitcase waiting in front of the desk. Values For A New Age combines the visual and uncanny language of the sceance, with computer controllers and live cctv to engage the viewer in a physical rendering of the cat in the box thought experiments of quantum physics. The piece is viewed though a peephole in the basement of a nuclear scientist's house. Peering through, the pages of a book calculating atomic weights flutter and turn. A static camera records ‘poltern’ activity within an empty room in a derelict house. In the installation, the film is playing on a monitor sat on the chair in the film. Additionally, the sound recorded at the time was plumbed through the floorboards. Performances for a camera with one tape running. A smoking gun sits on a desk, lit by a film projector in a darkened room.The gun (a thirty eight calibre snub nosed revolver) continually smokes, The smoke is made in a lo-tech smoke machine concealed within the desk and is pushed out of the machine and into the gun via a pipe attached to the fan of the projector. 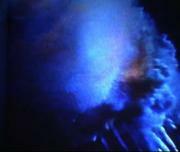 The projector literally drives the mechanics of the narrative, and with the released smoke gravitating towards the projector, it creates a real time loop. Peephole, hut, reflected video image, windscreen wiper mechanism attached to door, sound. An turnstile is wired for sound. Speakers are placed at either end of the municipal changing rooms. A feedback envelope occurs when activating the turnstile triggering very physical reflections walking around the installation. A rifle muzzle pokes out of a missing plank in a shed. It continually pans around, accompanied by the bugle call of the 'last stand'. A hand dryer suffering from pre-millenial identity disorder plays one of 99 recordings when activated.